Hercules Structural Systems Pvt. 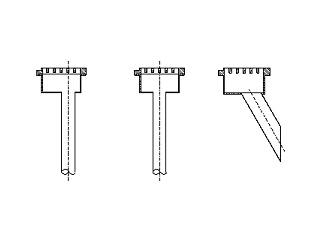 Ltd.
A drainage spout is a vertical pipe for carrying rainwater down from a platform. It is made from mild steel and galvanized to prevent corrosion or rusting due to water flowing through the pipe. Drainage spouts are manufactured and supplied according to MORTH specifications. Our range of spouts include simple spout with centered pipe, pipe 20 mm offset from Centre and skewed spout having pipe at an angle of 45 degrees from vertical.